If there is one sector of society that should be cultivating deep thought in itself and others, it is academia. Yet the corporatisation of the contemporary university has sped up the clock, demanding increased speed and efficiency from faculty regardless of the consequences for education and scholarship. 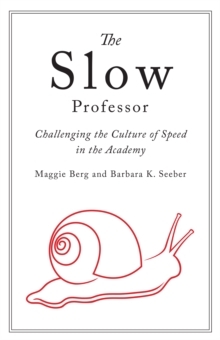 In The Slow Professor, Maggie Berg and Barbara K. Seeber discuss how adopting the principles of the Slow movement in academic life can counter this erosion of humanistic education. Focusing on the individual faculty member and his or her own professional practice, Berg and Seeber present both an analysis of the culture of speed in the academy and ways of alleviating stress while improving teaching, research, and collegiality. The Slow Professor will be a must-read for anyone in academia concerned about the frantic pace of contemporary university life.